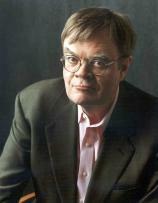 Garrison Keillor, author of nearly a dozen books, is founder and host of the acclaimed radio show "A Prairie Home Companion" and the daily program "The Writer's Almanac." He is also a regular contributor to Time magazine. A charming holiday farce, A CHRISTMAS BLIZZARD follows James Sparrow as he returns from Chicago to his lunatic family in Looseleaf, North Dakota in the midst of a historic blizzard.